On Wednesday my friend Jason and I went to the Hate Handles boulder before rain came for the weekend. We did some of the usual warm-ups and put the first sprinkles of chalk on the holds for this season. I managed to do a new link up that took over as the hardest line on the wall. A traverse into Dr. No. I named this new line No Means No v12. This does 5 or 6 campus style power moves into v11. It was pretty hard and really good. There are still 2 really hard project to go on this wall. 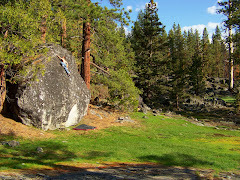 One is a link up with a sick opening crux that would lead into v11. The other is a pure line up the middle of the wall on nasty little edges and a crux deadpoint into a slopey pocket followed by a tough looking top out. My friends from Bishop are coming down next weekend to visit this area as well as the Twin Peaks area. Some crazy repeats and first ascents will no doubt go down.